The Bolivarian medical professionals travel across the continent to offer their ophthalmological expertise to Latin Americans. Oct 22 (tleSUR) Venezuela’s Mision Milagro (Miracle Mission) and a team of highly trained surgeons will perform at least 100 ophthalmological procedures in El Salvador this week, Foreign Minister Jorge Arreaza said. From repairing cataracts to removing pterygium or “eye webs”- a non-cancerous growth of clear tissue, the Bolivarian medical professionals travel across the continent to offer their services throughout Latin America. “Today our @Mision_Milagro with the support of @Petrocaribe, supports the people of El Salvador through surgical days at the National Hospital San Rafael…Bolivarian Solidarity! ALBA Cooperation,” Arreaza wrote on his personal Twitter account. Sixty-eight-year-old Leonarda Vilaseca was the first Salvadoran to benefit from the international program. 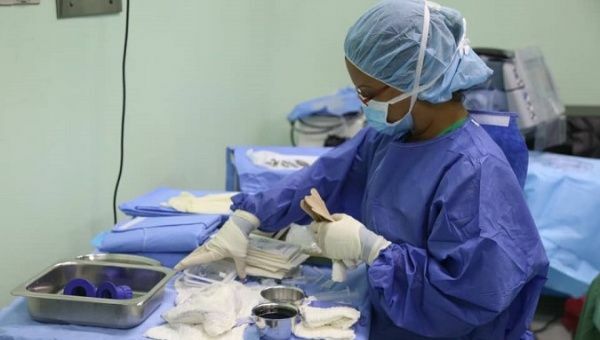 An average 14 procedures are completed throughout the day, Mision Milagro reported from Twitter, assuring that their work in Venezuela doesn’t stop while their team is abroad. Some 21 operations were conducted in Caracas Monday, thanks to Petrocaribe, the Venezuelan embassy in El Salvador confirmed.